I've been doing a lot of work talk lately, so I thought it would be fun to change things up a bit and share a peak inside our little home. Here it is! The front garden is looking a little rough at the moment, but we've got mint, strawberries, and flowers that are in the works. Our house is on a street called Willow, which is in one of the historic neighborhoods here in Fayetteville. The house was built sometime in the 1880s, which gives it quite a bit of charm (along with quite a few "quirks"). You might have noticed that there are two front doors, and that's because it is divided into two units, the upstairs and downstairs. We rent the downstairs. For the better part of four years, this was both our home and May We Fly headquarters, but in January I was able to move my workspace out of the home and into my studio shop (hallelujah). The first room you come to is the living room, which doubles as a dining room when we have guests over. It's also the most photogenic room, so I took lots of pictures of it. 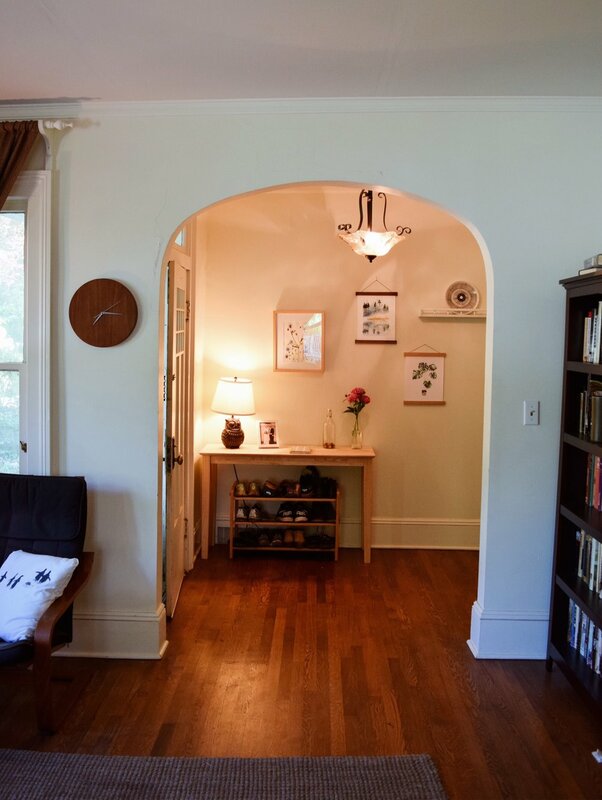 A long, winding hallway moves you to the back of the house. The clothesline photos were only meant to be a temporary solution, but four years later, they're still there. At the end of the hallway are both bedrooms, the bathroom, and my little home office. All the way at the back of the house is our dining nook, which is one of my favorite spots. This is where we eat most of our meals. In the mornings I sit here with my coffee and watch the birds outside. (P.S. my ridiculously talented sister is the maker of that gorgeous quilt. We use it to hide our laundry room). Finally, the kitchen! That little cookbook shelf was here when we arrived and makes me so happy. Our little friend on the windowsill. We built a fire pit in the backyard last summer and roast marshmallows out there just about every week in the warmer months. So, there you have it friends! The home of the Fischers. Despite its many quirks, we've really come to love this place and are so thankful we get to live here during our years in Fayetteville. Come on over any time!